Creating a movie is not for everyone, and neither is building your own business. While there are certainly “entrepreneurship” and “film studies” majors in college, the path to success is far from simply graduating and getting a job in your field. There are definitely parallels. With entrepreneurship, it could be years of struggling and building several businesses that fail before you finally hit on something big. For those in the movie business, it’s usually a long path of pay-your-dues jobs and roles before you get your first big break. The biggest takeaway is persistence. Whether you’re looking to make the next Skyfall or open up a Skydiving school, it’s going to take money. The good news is, now more than ever you don’t need a $200 million budget to get started. On the film side, for under $1500 you can get a DSLR camera that shoots high definition video, some basic lighting and sound equipment, a copy of Final Cut Pro X, and upload your masterpiece to Vimeo or YouTube for free to get started. The same thing goes for a web-based business, where building an online presence and marketing your business through social media is now cheaper than ever. When it does come time to ramp up, in addition to the traditional path of Venture Funding, newer crowd-funded sites let you pitch your product to the people. Over on Kickstarter, projects like a web comic book from my business partner Nate Cooper have raised $2,500, while there are ten projects that have brought in more than $2.5 million. Over at Indiegogo, there are currently 8,000 independent movies being funded. Next, what is your unique product or service? In the movie business, if you don’t have a new story to tell, you at least need to tell a time-honored tale in a new way. What makes your business different? How do you solve a problem? Why should I pay attention to you? If you’re an entrepreneur, then you are the director of the business. You don’t need to wear knee-high boots and shout “Action!” through a megaphone while sitting on an elevated chair, but in fact you do call the shots every single day. You’re responsible for keeping the production on track, staying within budget, and communicating your vision. In the movie business, you can have a well funded movie with a great story and direction, but if you cast the wrong actors, you won’t have a great film. The same goes for the employees of your business. When building something from the ground up, the first few hires in any startup are crucial. They affect how much work gets done, how quickly you can iterate and advance the business, and the overall energy and feel of the company. I definitely saw this first-hand when working at a startup in my second job. I was employee #3 and the first 10 people there weren’t just coworkers, they were like family. The partners built the team slowly and surely, adding employees by the skills needed (writers, designers, QA testers) but also for fit within the culture. I specifically remember as we hit about the 20 person mark and our IT needs were growing. They hired a guy that seemed to have sterling technical know-how, but a few of us weren’t sure how he’d fit in. The partners hired him anyway, desperate for someone to make sure everyone was wired up and technically advancing. However, he never gelled with the team, he was caught wasting time more than helping us succeed, and was eventually fired. They never made that mistake again. I recently had a mini-reunion with several of the employees – now 15+ years ago – and I was honored as a few of them told me how much of an influence I had on their career. We hired many of them as their first jobs, and more often than not it was giving someone a chance when their skills might not have been as polished. Some of them stayed there for years and years after I had left. I didn’t even know the effect I was having on them at the time, I was just being myself. If the lead actors are your employees, the supporting actors might be viewed as the support team around your business. Back in April 2011, I wrote The 10 people you need to successfully publish (or self publish) a book. The list included accountants, lawyers, agents, designers, and others. In business, I would add to that list people such as financial planners, coaches, mentors, and even a personal trainer to make sure you are taking care of your health to offset the stress of a new business. Basically anyone in your circle that can serve as checks and balances. Many of the best movies these days have special effects to surprise and delight their audience. What is the special effect in your business? What is it that you do that amazes your customers and causes them to buy? Is it over the top customer service? Is it the energy you bring to every meeting or event? Is it an incredible dedication to the design process? Think about your special effect. When it comes to launching an Oscar-worthy movie, every last detail about timing is meticulously coordinated. Most movies targeted for awards are released toward the end of the year, so that it is fresh on people’s minds. But the buzz starts far before that. Everything from the movie trailer to building buzz to straight up promotion is geared to elevate the brand to the top of people’s minds. Business owners can learn a thing or two from the movies. If you’re launching a new product or doing a new website redesign, is there a certain time of year that is optimal for doing so? For example, if you’re an entrepreneur building a new gaming app for the iPhone, when would be the best time to launch? In mid August when many people are on summer vacation? Or a few weeks later in September, when students are back in school, business picks back up, there are rumors of the next iPhone launch, and you can roll into the holiday season when a larger majority of people are thinking of getting the latest phone or tablet? Bottom line, don’t be afraid to submit your product for awards, and if you do win, be prepared, be humble, and be proud. Lastly, once this process comes to an end, you can bask in the accomplishment – but not for long. You’re only good as your last product, and if you taste success, you’re going to want more. A sequel. Just make sure you put the same passion and effort into your second go-around. We’re looking for the Bourne or Bond series, not Breakin’ 2 Electric Boogaloo. Do you ever worry about making the financial decisions for your business count? Adam Carolla pointed out some simple math on a typical movie: It costs $100 million to produce, runs 1 hour and 40 minutes – 100 minutes – so thus it costs $1 million dollars a minute. So you can imagine the pressure on a film crew when you have delays. How would you adjust your business if the project you were working on cost $1 million dollars a minute. Well, if you’re someone serious when it comes to your business’ finances, you need to keep track of everything accurately. 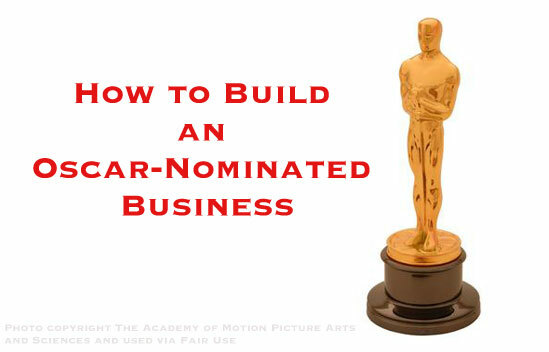 Oscar image via AMPAS. 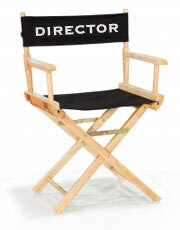 Director chair image courtesy of [siraphat] / FreeDigitalPhotos.net. 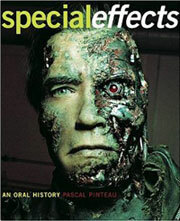 Special effects image via book on Amazon. This entry was posted on Monday, January 21st, 2013 at 4:43 pm and is filed under Branding / Advertising, Pop Culture / Entertainment, Social Networking / New Media. You can follow any responses to this entry through the RSS 2.0 feed. Both comments and pings are currently closed.